Saint Sabbatius of Solovki came to the Saint Cyril of White Lake Monastery (Kirillo-Belozersky Monastery) in the year 1396, where he received the monastic tonsure. He there pursued asceticism for a long time, unquestioningly fulfilling all obediences. His humility, gentle love towards the brethren and his strict life distinguished the monk Sabbatius among his fellow ascetics. He soon became burdened by the attention and esteem of the brethren and laity coming to him, and having learned that on Lake Ladoga is the rocky island of Valaam, he decided to settle there. 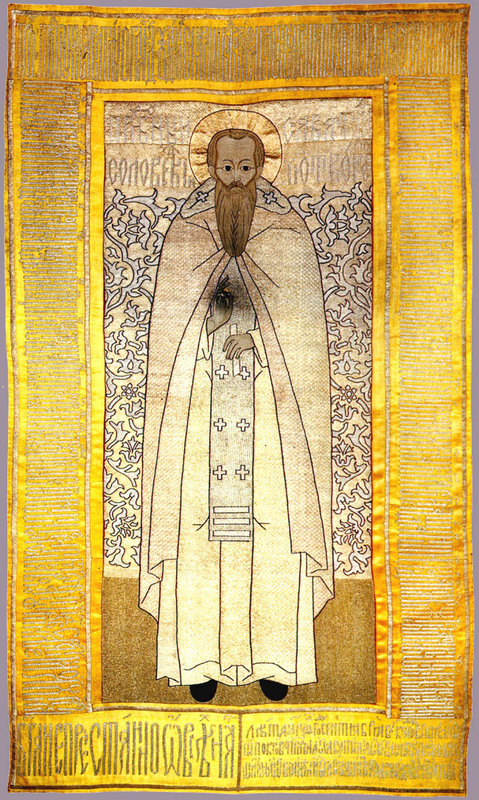 The brethren of the Saint Cyril of White Lake Monastery were very sad to be parted from their Elder. At Valaam worldly fame also began to disquiet the humble Elder. Then the monk learned that in the north was the uninhabited island of Solovki, and he asked the abbot’s blessing to settle there in solitude. But the abbot and the brethren did not want to be separated from their holy Elder. For a certain time Saint Sabbatius remained at the chapel near the mouth of the Vyg River, in the environs of Soroka. There he encountered Saint Germanus (Herman) pursuing asceticism as a hermit, and together they decided to settle upon the island. In a frail boat, praying to God, the Elders set off upon the harsh sea and after three days they reached Solovki Island. The ascetics settled by the Sekirna hill, where they raised up a cross and built their cells (this was 13km from today's Solovetsky Monastery). In the severe conditions of the north, the Elders hallowed the unpopulated island by their exploits. Here also the enemy of mankind, the devil, tempted the holy Elders. A certain fisherman with his wife, moved with a sense of envy, came somehow to the island and settled near the ascetics. But the Lord did not permit the laypeople to remain near the monks. Two youths in bright garb appeared to the wife of the fisherman and struck her with rods. The fisherman took fright, quickly gathered his things and hastened to return to his former place of residence. 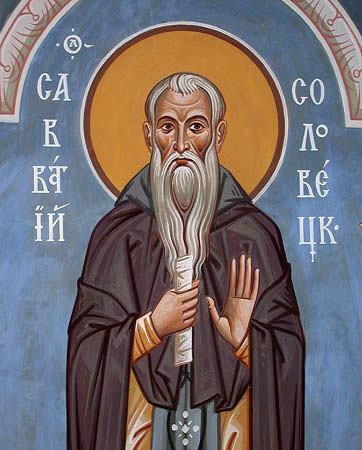 Once, when Saint Germanus had gone for supplies along the Onega River, Saint Sabbatius, alone and sensing his impending end, turned to God and prayed that He would grant him to partake of the Holy Mysteries. The monk sailed for two days to the mainland and at ten versts from the Vyg River encountered the abbot Nathanael, who had come to the distant settlement to commune a sick Christian. 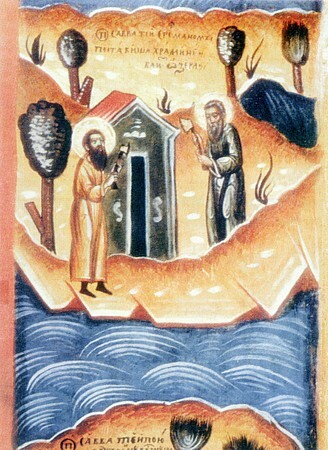 Abbot Nathanael rejoiced at meeting the monk, fulfilled his wish and heard the account of his exploits on the island. In parting, they agreed to meet at the church along the Vyg River. Suddenly there was an earthquake, and a storm arose on the sea. Taking fright, the merchant stayed where he was. In the morning when he entered the cell for a blessing, he saw that the Elder was already dead. He and Abbot Nathanael, who had just arrived, buried Saint Sabbatius at the chapel and wrote a manuscript of his Life. This occurred on September 27, 1435. 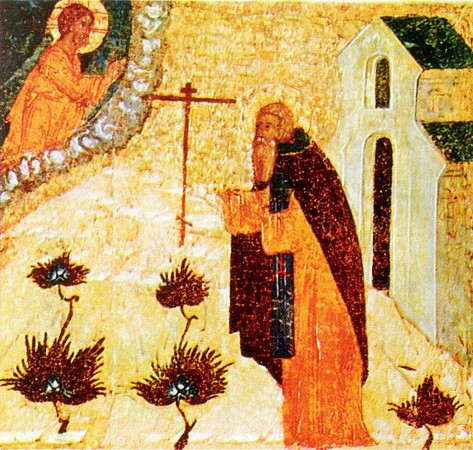 After Sabbatius's death, newly arrived monks began the construction of the monastery which would come to be known as Solovetsky. 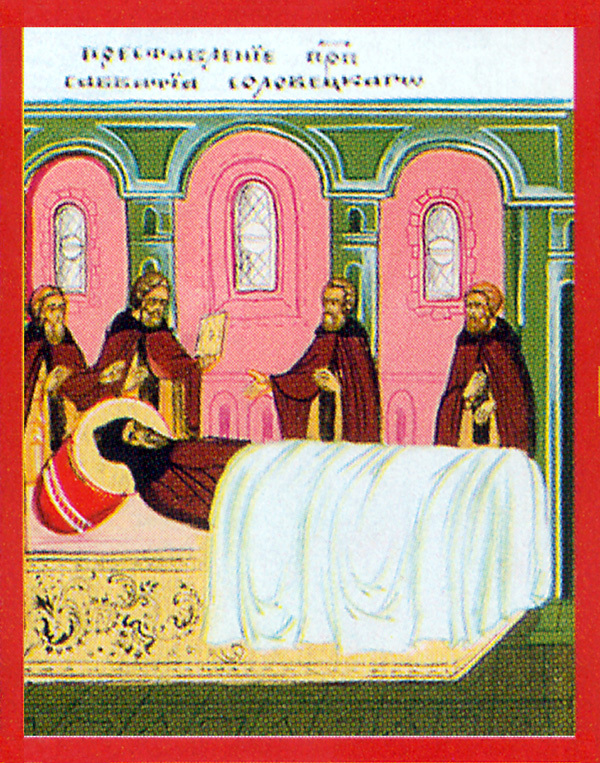 After thirty years, the relics of Saint Sabbatius were transferred by Saint Zosimas (April 17) and the brethren of Solovki Island, placing them in the Transfiguration Church. 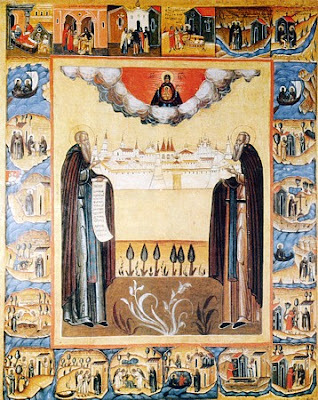 In 1566, the relics of Saints Sabbatius and Zosimas were transferred into a church, named in their honor (August 8). He was glorified by the Church in 1547. Thou didst abandon the world and fight the good fight, by hardship, vigil and prayer. Pray to Christ our God to save our souls, O holy Father Sabbatius. Fleeing the turmoil of life, thou didst dwell on an island in the sea. Thou didst take up thy cross and follow Christ, and toil in vigils, fasting and hardships. Thou hast become the adornment of the venerables, and we lovingly celebrate thy memory. Pray to Christ our God to save our souls, O venerable Sabbatius.